Publisher: Vol. 1 translated by Ernest Dowson, G.A. Green and A.C. Hillier; vols. 2 and 3 translated by A.C. Hillier.Includes indexes.Bibliography: v. 1, p. 557-586; v. 2, p. 775-804; v. 3, p. 805-830..
Vol. 1 translated by Ernest Dowson, G.A. Green and A.C. Hillier; vols. 2 and 3 translated by A.C. Hillier.Includes indexes.Bibliography: v. 1, p. 557-586; v. 2, p. 775-804; v. 3, p. 805-830. 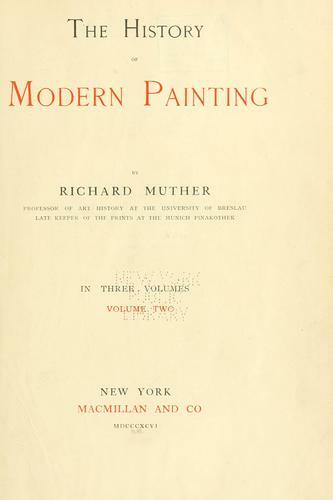 We found some servers for you, where you can download the e-book "The history of modern painting" by Muther, Richard TXT for free. The E-Library free team wishes you a fascinating reading!